German translation of ‘Cyrillus’ (Bongiovanni da Messina), Speculum sapientiae. The Ashburnham copy. 262 x 194 mm. – 88 leaves. With 84 pen-and-wash drawings. Das Buch der natürlichen Weisheit is a German translation of the Speculum Sapientiae, a popular collection of fables and apologues. While attributed to an apocryphal bishop St. Cyrillus, the text was probably the work of the Italian Dominican Bongiovanni da Messina (active 1337-l347), who structured these fables within a Christian moral framework despite their origin in 'pagan' antiquity. Translator Ulrich von Pottenstein (c. 1360-c. 1417) was appointed chaplain of Duke Albrecht IV of Austria and canon to the Vienna Cathedral. The pen-and-wash drawings at hand consist of eighty-four animated scenes that are drawn in bold outlines and painted in colour. The illustrator added great charm to his creatures. Humans and animals are depicted with equal energy and lively expression, sometimes increased by their jaunty overlapping of the frames. Overall, these pictures gave the animals instantly recognisable personality traits to convey eternal truths of human nature. Interestingly, some rubric headings for the fables function as instruction to the illustrator. Originally created in manuscript form and printed only later, Volksbücher like the book at hand, may not often have been available to the rural population, yet these texts played a vital role among townspeople, for instance via the Meistersinger schools. Festivals with open singing and storytelling on urban podia as well as individual performances on markets continued the influence of oral traditions of these fables. Large audiences were familiar with the stories of both classical and medieval European literature. In the abundantly illustrated manuscripts of popular witty satires in fables, illustrations gave audaciousness to the weak confronting the strong. Indeed, the illustrations seem fundamental to the success of Ulrich von Pottenstein's translation. 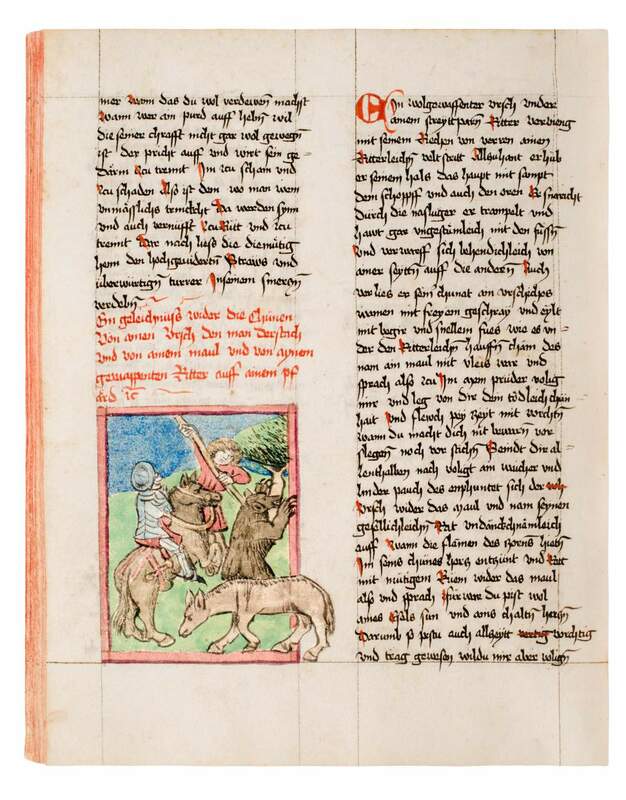 Whereas the Latin original was rarely illustrated, the majority of the German manuscripts have images. Illustrated Volksbücher - at least those written on paper - were so popular that most have been read to 'pieces', making such manuscripts precious and unique. This is the only copy known in private hands.